"In the New Mass the Offertory was replaced by a formula from the Talmud, a classic of hate-literature directed against jesus with an intensity and perversity perhaps never equaled." Many articles have been written about the objectionable changes to the Mass which culminated in the Novus Ordo Mass of Paul VI, and scarcely anything of substance can be added to the incisive Ottaviani Intervention or the exhaustive study of Michael Davies in his third volume of Liturgical Revolution. Even Cardinal Ratzinger is on record admitting the practical disaster of the liturgical reform. It is obvious to devout Catholics that the faithful have been submerged during the period of the New Mass in a swamp marked by non-attendance, widespread unbelief, immorality, irreverence, indifferentism, and compromise. Catholics have seen even their formerly orthodox leaders flailing in a quicksand of ambiguity. While the causes of this broad crisis cannot be solely attributed to the changes in the Mass, an important connection exists, since the rule lex credendi, lex orandi (we believe as we pray) remains vitally true. Yet one of the most subtle and blasphemous changes in the prayer of the Mass has been overlooked. We have been told that the Offertory was replaced by a "Jewish table blessing" -----a change objectionable enough for a host of reasons. But the reality is far worse: for the Offertory has been replaced by a prayer with no connection to the practices of the Old Testament Israelites, but rather which stems from Christ-rejecting Rabbis who agreed with the Sanhedrin that demanded His death. The astonishing truth is that in the New Mass, the Offertory, was replaced by a formula from the Talmud, a classic of hate-literature directed against Jesus with an intensity and perversity perhaps never equaled. 1 This sacrilege was slipped past the faithful without notice, and deserves exposure as yet one more reason to loudly demand the restoration of a liturgy which honors rather than blasphemes the One Who first said and instituted the Mass itself. The Offertory had long been a target of the enemies of Christ and His Church, since it clearly expresses the propitiatory content of the Sacrifice of Christ which is repeated in an unbloody manner in the Mass. The was the subject of a stern warning by Pope Pius XII in Mediator Dei, some of the pretended resurrection of early traditions was patently fraudulent. Nowhere is this more clearly evident than in the supposed revival of a "Jewish table blessing" from the days of the first Jewish converts to Christianity as a replacement for the Offertory. We are supposed to believe that this scrapping of the Offertory marks a return to the type of faith and liturgy of the earliest Church, and furthermore supposedly reminds us of our Jewish roots. All of these alleged reasons and explanations are simply lies, and their subversive nature is underscored by the fact that they succeeded where Luther failed in eliminating the Offertory which he hated. The lies behind this substitution are truly multiform. First, the Offertory was not replaced by a Jewish table blessing, but by a rabbinical blessing from the Talmud, as we will see below. Second, the Talmud was not written during the life of Christ or His Apostles, and could not have been reflective of anything in the early Church except the traditions of its first enemies. In fact, the Talmud was written in Babylon after the Rabbis had rejected the Messiah -----written in fact by Rabbis in full and venomous agreement with that rejection. Third, the Talmudic blessing is part of a list of "blessings" in the Talmud which also contains curses of Christians. Fourth, what we now know as Judaism-----the rabbinical swamp of blasphemy and paganism codified in the Talmud-----has no connection to the faith of the Old Testament, for it nullifies it (Matthew 15:1-9). Fifth, borrowing any prayer from the Talmud is arguably treason to Christ, for the Talmud-----burned by several astute Popes-----contains the most horrid blasphemies against both Jesus and Mary known to man, only a few of which we will quote for purposes of documentation. Before supporting these contentions, it is worth noting that the Second Vatican Council Fathers were all warned that covert forces of Judaism and Freemasonry were about to stage a "coup" at the Council, under the guise of a "brotherly reconciliation" and under the pretext of "bridge-building". This warning came in the form of a large and thoroughly documented tome entitled, The Plot Against the Church, penned by several authors under the pseudonym Maurice Pinay. One of the actual authors was Fr. Saenz y Arriaga, later the subject of a questionable excommunication following his exposure of the public wearing of the Jewish Ephod of Caiaphas by Paul VI-----an emblem replete with Masonic as well as rabbinical symbolism. Nevertheless, Masons bored from within, in accordance with their own plans which had been exposed by Monsignor Dillon in 1884 and published by Pope Leo XIII one year later at his own expense-----after the Pope had himself written Humanum Genus, the most expansive papal condemnation of Freemasonry ever penned. 8 One of the ensuing Masonic triumphs against the Church was clearly the wreckage of the liturgy, led by one of their own members, as we have seen. The hallmarks of treachery are apparent to those with eyes to see and a sensus Catholicus and need no recapitulation here. But this background of anti-Christian subversion and intrigue needs to be stressed to understand the truly blasphemous substitution of the Offertory with a nearly verbatim passage from the masters to whom the Masonic institution is pledged in service as evidenced in the Royal Arch Degree referenced above. In The Essential Talmud, Rabbi Steinsaltz writes of the supreme importance of the Babylonian Talmud: "Babylonian scholars were soon attracted to the new center and thousands of disciples flocked to study there." 11 What Christ condemned as "the traditions of the elders" (Mark 7:1-13), Rabbi Steinsaltz calls the "oral law," stating that "the work of preserving and codifying the vast body of oral law went on for several generations . . . " 12 This oral law was eventually written down as the Talmud, the most important and authoritative version being the lengthy Babylonian Talmud. Rabbi Steinsaltz traces the gradual development and redaction of the Babylonian Talmud, commenting that "the natural authorities best equipped to clarify problems were the heads of the great Babylonian academies of Sura and Pumbedita". Their authority was unquestioned, and consequently the Talmud assumed the greatest possible importance, eclipsing the Old Testament as the central text of Judaism: "Historically speaking," writes Rabbi Steinsaltz, "the Talmud is the central pillar of Jewish culture" 13-----note: the Talmud, not the Old Testament. From the redacted Talmudic oral traditions, which Christ denounced as a special mark of the Pharisees and Scribes, came what we know today to be Judaism. And it is from this false religion, premised on the rejection of Jesus, that the replacement of the Offertory in the Mass was culled. The true origin of the so-called "Jewish table blessing" is by all evidence the Talmud itself, since absent any other testimony one cannot attribute an authentic Old Testament origin to the practices of those who freely invented so many objectionable traditions that Christ Himself condemned them on several occasions (Mark 7:1-13; Matthew 15:1-9; Matthew 23:25-26). Hence in the Jewish Encyclopedia explanation of "Benedictions," we find that "in the course of time all these benedictions assumed a stereotyped form; and the rule is given by Rab that, to be regarded as a regular benediction (Ber. 40b), every benediction must contain the name of God, and by R. Johanan that it must contain the attribute of God's kingship." In other words, the Talmud and its rabbinical authors dictated the form of the blessing in Judaism which we later find brazenly imported into the New Mass by Bugnini's committee. The source of the replacement for the Offertory is clarified in the Jewish Encyclopedia, which introduces a list of "benedictions prescribed in the Talmud and adopted in the liturgy; each of them beginning with the formula 'Blessed art Thou, O Lord, Our God, King of the Universe'!" Although the liturgy of Judaism is intended in the above reference, ironically this Talmudic benediction became repeated almost verbatim in the New Mass, But of even greater irony is the fact that in this instance the Latin is closer in form to the Talmud than the English translation done by the ICEL: for the Latin reads, Benedictus es, Domine, Deus universi, which translated literally becomes Blessed are You, Lord, God of the universe, whereas the common translation one encounters is Blessed are You, Lord God of all creation. The difference is small, but the Latin more explicitly parallels the Talmud, Tragically, those who hope for a "purification" of the New Mass by rendering it in Latin would only render the blasphemous parallel between the Offertory's replacement and the Talmud more exact. As One reads the Talmud and the Jewish Encyclopedia, it becomes apparent that this formula extends to all benedictions, not merely to table blessings. By the 2nd Century, states the Jewish Encyclopedia, "they were already fixed as to form and number, since R. Meïr declares it to be the duty of everyone to say one hundred benedictions daily . . . " These "benedictions" include reciting a "blessing" after vacating one's bowels ("who has formed man in wisdom and created many orifices . . . "), thanking God for not making one a Gentile, and thanking God "who hast not made me a woman." Hebrew University tells us, "in the most important section of the weekday prayer-----the 'eighteen blessings'-----there is a special curse, originally directed against Christians, Jewish converts to Christianity and other Jewish heretics: 'And may the apostates have no hope, and all the Christians perish instantly.' 20" Rabbi Steinsaltz comments, "One of the alterations introduced into the service shortly after the destruction [of the Second Temple] was not, however, connected to the Temple itself but to the problem of the heretic, Gnostic and Christian sects . . . Matters reached such a pass that the Sanhedrin sages at Yavneh decided to add to the Shemoneh Esreh an additional benediction (which is in fact a curse) on heretics 21 . . ." One can see that the prayer-form in the New Mass was used not only for table and even bathroom "blessings" but also to introduce curses of Christians, as even hesitantly admitted by Rabbi Steinsaltz. Such is the chill-inducing context of the source of the prayer which replaced the Offertory in the New Mass. Let us be frank: the context is nothing short of blasphemy and sacrilege, for the Talmud and its authors were filled with hatred and curses-----verifiable today in the Steinsaltz Talmud-----against Christ and Christians. 22 The fact that the version of the prayer present in the New Mass is not overtly blasphemous is no more defense of its inclusion than would be the liturgical importing of an innocent-sounding passage from Satanist Meister Crowley's Book of the Law 23 in the name of reaching out to the "misguided" or "connecting with those who have a Seed of the Word however obscure." Let us sweep aside such transparent hogwash and call a spade a spade, a blasphemy a blasphemy, and loudly and persistently demand of Rome the full restoration of what is ours by right: a Mass not born in treason and marked by sacrilege. 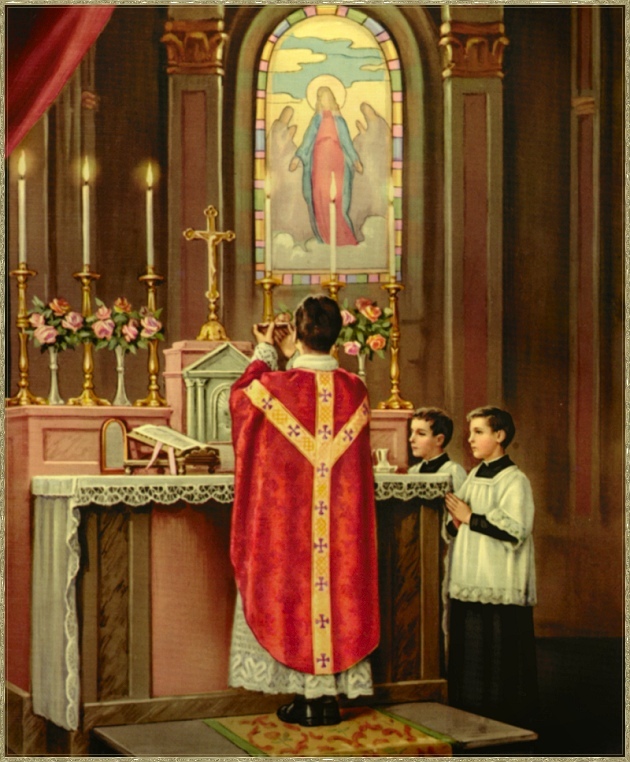 post-conciliar reforms-----including the reform of the liturgy. And nowhere is the hand of an enemy more clearly apparent than in the replacement of the Offertory with words which are a hallmark of a different religion, reproduced from the premier anti-Christian text in the broad history of human resistance to grace. Craig Heimbichner is a convert and recognized expert on Freemasonry and the occult. A speaker and writer, he is available to discuss the dangers of the occult and its influence are today. He may be reached in care of Catholic Family News. 1. For this reason the Talmud was ordered burned by Innocent IV in Bulle Impia Judeorum Perfidia, and later again by several Popes. 2. The facts were related in a September 12, 1978 article in Osservatore Politico in Rome, Italy entitled La gran loggia vaticana. The author reportedly died after printing the list of prelates. 3. Captain William Morgan, a Royal Arch Freemason, published the Masonic rituals and secret oaths in 1827. He was kidnapped and murdered by fellow Masons, an event which led to the original third political party in the United States: the Anti-Mason Party. 4. Hebrew for "holy" or "consecrated." 5. See Secret Societies Illustrated, published by Masonic publisher Ezra A. Cook Publications, Inc., p. 123. 6. Duncan's Masonic Ritual and Monitor, Malcolm C. Duncan, p. 249. 7. The excommunication of Freemasons was removed from the 1983 Code of Canon Law, although Cardinal Ratzinger subsequently clarified on November 26, 1983 that membership is a "grave sin" which excludes one from lawful reception of Holy Communion. One wonders, however, why the explicit canonical ban was removed. It is certainly true that many Catholics heard of this change and joined Masonic Lodges. 8. The reader is referred to the excellent summary of these documents by John Vennari, The Permanent Instruction of the Alta Vendita: A Masonic Blueprint for the Subversion of the Catholic Church, (TAN Books and Publishers, Inc.) Available from Catholic Family News, $4.00US postpaid. 10. Adin Steinsaltz, The Essential Talmud, p. 84. 11. Adin Steinsaltz, Ibid., p. 43. 12. Steinsaltz, Ibid., p. 41. 14. The unbiblical and unCatholic premise of Cardinal Ratzinger's work, Many Religions-----One Covenant: Israel, the Church and the World, Ignatius Press, 1999. 15. St. John Chrysostom, Discourse on Judaizing Christians, III (2). 16. The day this was decreed, St. Simon of Trent was removed from the Roman Calendar-----the child Martyr who had been killed by Jews on Good Friday out of hatred of Christ. 17. St. John Chrysostom, Ibid., V (2). 18. John Paul II was directly confronted on this occasion with the burning of the Talmud by his predecessors. His response was to apologize for "the acts of discrimination, unjustified limitation of religious freedom . . . in regard to the Jews . . . by anyone," and he added,"I repeat, by anyone." See Luigi Accattoli, Man of the Millennium: John Paul II, pp. 139-40. If John Paul II included prior Popes in his apology, by clear implication he included St. John Chrysostom, who was famous for his fiery denunciation of Talmudic poison. 19. Adin Steinsaltz, Ibid., pp. 101-102. 20. Israel Shahak, Jewish History, Jewish Religion, p. 63. 21. Adin Steinsaltz, Ibid., p. 105. 22. An excellent summary of these passages can be obtained in the concise reference work Judaism's Strange Gods by Michael A. Hoffman II. 23. For example, would a neo-Catholic object to the phrase, "There is no bond that can unite the divided but love"? Innocent enough in itself, it is a quotation from the odious Masonic Book of the Lawof Crowley, which,liketheTalmud, contains blasphemy against Jesus and Mary. If one finds a quote from Crowley objectionable-----as one should-----the objection holds a fortiori against the Rabbis who lived closer to the time of Christ, and yet denigrated Him with even worse blasphemy in the Talmud. 24. Maurice Pinay, The Plot Against the Church, p. 15.